If I ever go missing for a couple of hours, don't call the authorities. You're likely to find me in the kitchen with crazed eyes, covered in flour, and mumbling something about cookies. I'm trying to cut down on the habit, but the longer I stand in the kitchen, the more time I have to evaluate the ingredients I have on hand and to unexpectedly make desserts under the principle of "needing to use up that butter!". Well, this time it was almond flour lovingly made from leftover almond pulp, and the only natural thing to envision when faced with a surplus of such an ingredient is a chocolate chip cookie. 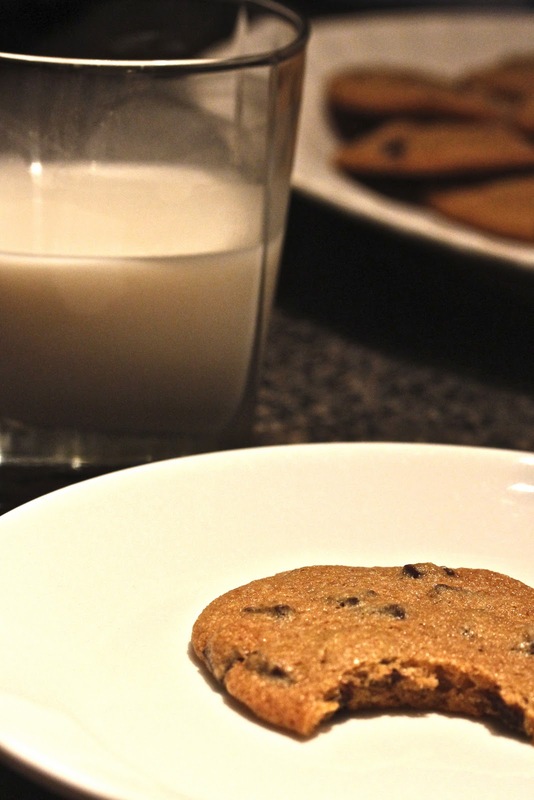 A glass of cold vanilla almond milk with a warm chocolate chip cookie. I should go missing more often. Position racks in the upper and lower thirds of the oven and preheat to 325º. Line 2 cookie sheets with parchment paper. In a medium bowl, whisk together the flours, salt and baking soda. In a large bowl, whisk together the butter, sugar, egg and vanilla to combine. Gently stir the wets into the dries until almost combined, then fold in the chips to combine. Scoop the cookies into 1" balls (I use the purple-handled ice cream scoop) and space 2" apart on the lined cookie sheets. Bake for about 12 minutes, rotating once, until puffed all over and just set around the edges. Let cool, then use a thin metal spatula to remove from the sheet. These stay moist for several days after baking, stored in an airtight container.